Citrus is a mobile wallet which allows you to manage fund transferring and requesting process in a single tap. The cash present in your Citrus Wallet Can be used for various purposes like to recharge mobile, DTH, data card or shop online and much more. Citrus Cash App also allows you to split bills with your friends when you are eating out or even when you want to gift money instantly to your dear and loved ones who is far away from home. So now let’s find out How to Withdraw Citrus Cash to Bank Account. 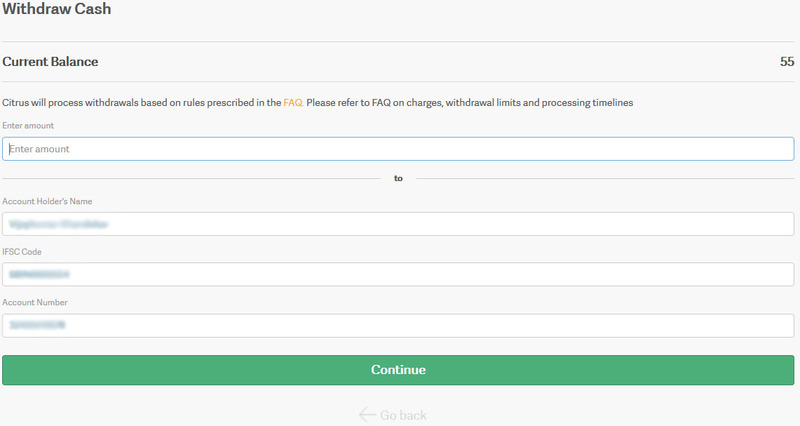 Step by Step Process on How to Withdraw Citrus Cash to Bank Account? Withdrawing or Transferring Citrus Cash to Bank Account is a very simple process. But before proceeding with Steps on How to Withdraw Citrus Cash to Bank Account, lets know the limitations and conditions of transferring Citrus Cash to Bank Account. There are no charges or fees included on transferring funds from Citrus Cash to Bank Account. Per Month you can withdraw maximum Rs.3000/- from your Citrus Cash to Bank Account. In case if you have received instant refund from any merchant partner of Citrus you can withdraw maximum Rs.25000/- per month. After withdrawal request is placed the amount will get reflected into bank account within 1 or next business working day. There are two ways with which you can withdraw Citrus Cash to Bank Account, through CitrusPay website and through Citrus Cash App. So we will explain to you How to Withdraw Citrus Cash to Bank Account with these both ways. How to Withdraw Citrus Cash to Bank Account through CitrusPay Website? Login to CitrusPay Website by clicking here. Once you are logged in to your CitrusPay Account, just click on my cash. In my cash page just click on withdraw cash> enter the amount, bank account holder’s name, bank account IFSC Code, followed by Account Number and click on Continue. In the next page Withdraw Transaction Successful message with details of the withdrawal request will appear. That’s it you are done withdrawing Citrus Cash to Bank Account through CitrusPay Website Successfully. How to Withdraw Citrus Cash to Bank Account through Citrus Cash App? Just Install Citrus Cash App onto your device from respective app store. Once the Citrus Cash App gets installed just tap on the app and login into your account. Just tap on the app drawer on the top right corner of the app screen and select the ‘Withdraw Money’. Enter the amount which you want to transfer, and fill below form by entering your bank account details and tap on withdraw. That’s it you are done withdrawing money from your Citrus Cash App to Bank Account Successfully and you will get the Transaction Successful Message with transaction details in the next screen in the app as well as on your registered mobile number. What are the charges of withdrawing money from Citrus Wallet? As of now Citrus is not charging any fees to transfer money from wallet to bank account. There is no minimum withdrawal limit but maximum you can withdraw upto Rs.3,000/- to your bank account per month. And yes you can load the funds from your Freecharge Go Virtual Card into Citrus Wallet and then later on withdraw it to your bank account without any fees. Once you receive message about reversal from Citrus, the amount usually gets credited back to your Credit/Debit/Bank Account in 2 to 3 working days. It really does not happen! Just a saying! Citrus never transfer the money to bank. Are Credit Card Issuer have any objection on this kind of cash withdrawal? 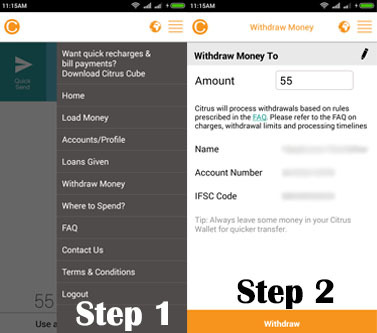 How to transfer citrus wallet to debit bank account. Please tell me . Use udio please! Citrus is a scam/fake! Because many people had lost their money! I recently did shopping online and they had citrus payment mode. I used my debit card and After debiting the amount I got to know that the product is not in stock and hence order was cancelled so they placed a refund request but the amount didn’t get credited even after 5 days. After continuously following and showing my bank statement they checked it with citrus and now today I got a message informing about the transaction of that amount from citrus but still my bank isn’t credited with that amount yet. I am totally confused whom to blame and how much longer do I have to wait for my money to be back. u cant withdraw,,,u write to citrus,,they will give some non-sense answer…ur money u need to spend or it’s gone. i lost 5000…they wont care if somebody is asking for transfer…and what kind of have limits transaction limit…it’s my money..not theirs to decide…u can’t handle more than 3000 transaction..i’ll find another bank….i got my money deposited into citrus by some vendor…i my money just gone. Use UDIO! I TRIED AND ITS THE BEST. The phone no used for this is discontinued.. When i try to change it with mynew phone no, its not letting me do that on mobile app? Try doing it by logging in into Citrus Website. Try contacting Citrus Customer Care to get your funds back in wallet.